Giving the appearance of a floating tabletop, this TV console design is sure to stand out in any living or family room space. A gorgeous rich cappuccino wood finish offers a contemporary flair but is neutral enough to fit in with a multitude of different home decors. Three drawers provide ample storage space for DVDs, remotes, and electronic accessories, while the open shelf design easily houses a variety media players. The sleek brushed hardware completes the updated and chic vibe. The TV Stands Contemporary TV Console by Rooms Collection Two at Rooms Furniture in the Houston, Sugar Land, Katy, Missouri City, Texas area. Product availability may vary. Contact us for the most current availability on this product. The TV Stands collection is a great option if you are looking for furniture in the Houston, Sugar Land, Katy, Missouri City, Texas area. 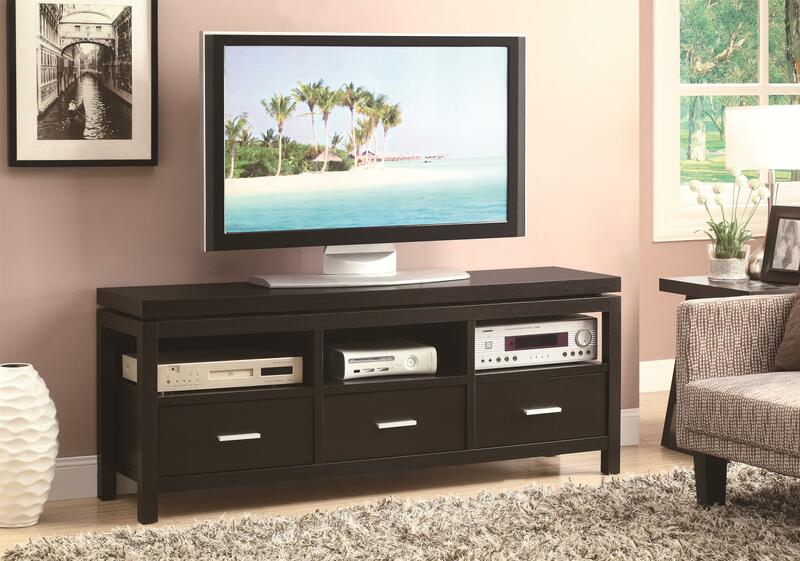 Browse other items in the TV Stands collection from Rooms Furniture in the Houston, Sugar Land, Katy, Missouri City, Texas area.